Preparations For 27th May Adelaide event are nearly finished. The Spec ‘C’ subaru has been fully serviced, cleaned, checked, and oil & fluids replaced in preparation for the demanding roads offered for the first round of the South Australian round of the Tarmac Championship in Adelaide. The team will depart Perth in the new “Service Barge”, Sign Here’s oldest ( but the best !!) toyota van that Sign Here have kindly donated to support the car in 2011. The Spec ‘C’s last event was the Targa Wrestpoint Rally held in Hobart in late January which proved an important event for the Perth based team of Stewart Liddle and Michael Lloyd. The Rally started Saturday Jan 29th and would head straight to the four 23 kilometre long stages of Tahune airwalk. This series of four stages would stamp a probable decider on the remaining nine stages as the Tahune portion would make up one half of the total kilometres the cars would cover in the two days of battle comprising of 200 competitive kilometres. The “top” australian teams would thunder through the superfast forest with the first stage win being taken by Kevin Weeks and in second place Jason White in the brace of Lamborghini Supercars, the Sign Here boys claiming 14th quickest in the Subaru. Stewart and Michael had to ‘bide their time’ as the 06 Subaru is no match to the gaggle of Supercars on fast, flowing stages, all having at least 50% more power than the Spec ‘C. 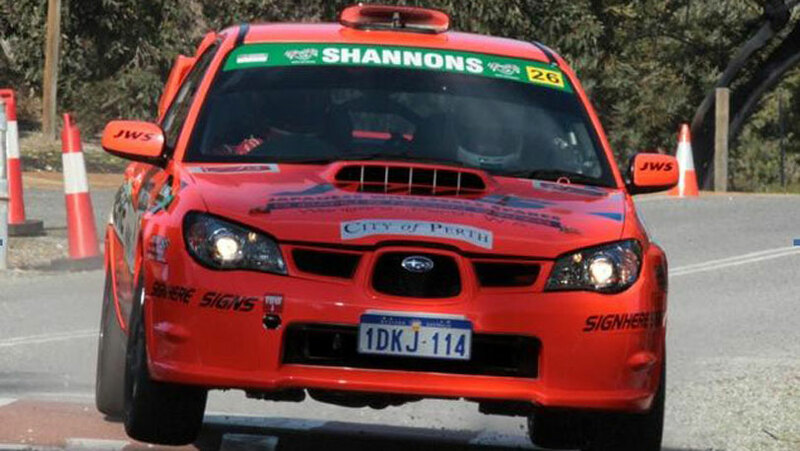 The remaining tight, twisty ‘ stages suited the Perth pair and the Spec ‘C’ Subaru posted top 7th and 8th times against Australia’s best for the rest of the event, eventually finishing a creditable 7th in class from 37 ‘modern’ car entries.